This colorful middle-eastern dip is vibrant and delicious. 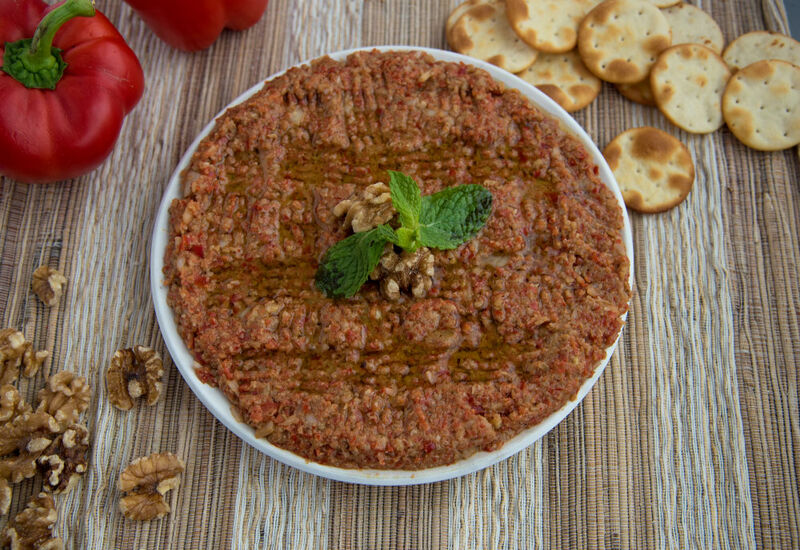 Roasted red pepper is perfectly paired with pomegranate molasses and walnuts for this wonderful addition to your holiday party menu. Add Aleppo pepper to your spice pantry. It has a mild heat level, is coarsely ground, and salt is used during the drying process. Red crushed pepper can be substituted but be sure to use less. Per Serving: 73 calories; 7g fat; 3.4g carbohydrates; 1g protein; 0mg cholesterol; 37mg sodium. I really like this spread! It has a great texture and delicious flavor. I didn't have pomegranate molasses, but I still love the way it turned out. This was a delicious dip with authentic middle eastern flavors. I used about 1 teaspoon of red crushed pepper instead of aleppo pepper, but am definitely on the hunt to find and try this ingredient.